Jay Clarke and Harriet Dart in action in the doubles. Britain’s Harriet Dart is having to put her holiday on hold after getting through to the quarter-finals of the Wimbledon mixed doubles with Jay Clarke. Dart, 21, was due to go on a week-long break to Santorini today, but she did not account for conquering top seeds Mate Pavic and Gabriela Dabrowski 6-3 6-4 in yesterday’s match. The pair, who were both handed wild cards into the singles last week, will meet the winner of Juan Sebastian Cabal and Abigail Spears versus Robin Haase and Kirsten Flipkens. Dart said: “I was supposed to go on holiday, that’s ruined. I will be going late. Clarke, 19, and Dart have never played together up until this tournament, but they are having fun. Clarke commented: “We have never played together so we didn’t know what to expect. You have to enjoy, you can’t take doubles too seriously. 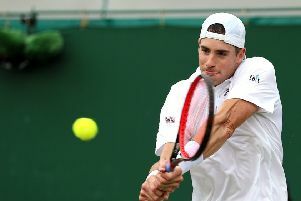 Joe Salisbury’s brilliant Wimbledon story also continues as he moved into the semi-finals of the men’s doubles with partner Frederik Nielsen. The 26-year-old Londoner, playing in his first grand slam in the men’s draw, and the Dane saw off Ben McLachlan and Jan-Lennard Struff 7-6 (8/6) 4-6 7-6 (7/2) 7-6 (7/4). The pair have had success in the build-up to the tournament, winning Challenger-level events in Loughborough and Nottingham and will next face Jack Sock and Mike Bryans. Dom Inglot is also in the men’s semi-finals after a four-set win with Franko Skugor. The English-Croatian pairing might not be so friendly tonight, but they triumphed 6-3 6-7 (2/7) 7-6 (7/1) 6-4 against Haase and Robert Lindstedt on Court One. However, fifth seeds Jamie Murray, brother of Andy, and his Brazilian partner Bruno Soares went down in five sets to 13th seeds Raven Klaasen, of South Africa, and New Zealander Michael Venus.